NEW! This unique TV-style game show includes very simple trivia questions for all ages...and it includes a talented emcee, lights, and flashy backdrop. 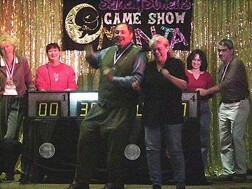 Sample a short video of Game Show Mania fun! 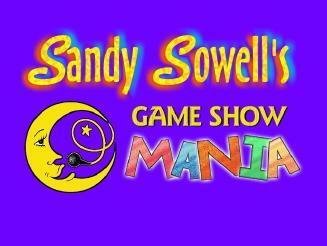 SANDY GETS GAME SHOW MANIA GOING! The glitter, flash, and flourish of an in-studio production: music, lights, announcer, electronic scoring, sound effects - all the bells and whistles! We bring you all the high spirited fun and excitement of a live television game show! 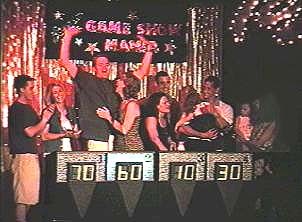 The audience stays involved with the contestants- clapping, cheering on their team, guessing the answers themselves. One of the Game Show challenges, 'Walla Balla', brings down the house! 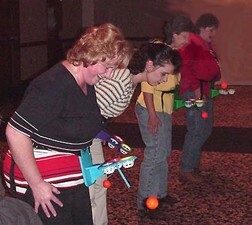 Playing the "Wango Tango Challenge", contestants learn the meaning of "It Takes TWO To Tango"
Contestant's work together to put the rings on their Conehead partner. Audience team captains wear these Olympic style medals to help lead their team to victory. The winning team leader gets to keep their coveted medal! 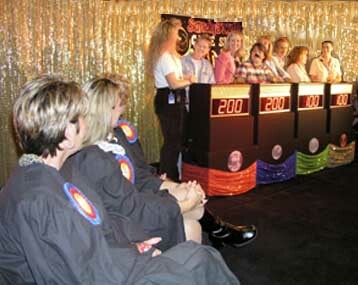 In 2003 we updated our contestant's equipment. Take a look!!! Sequined backdrop and beautiful equipment set the stage for a successful event. The audience is divided into 4 teams: Quarters, Dimes, Nickels and Pennies. 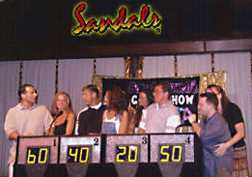 Several rounds of 8 contestants each are played during the 75 minute show. 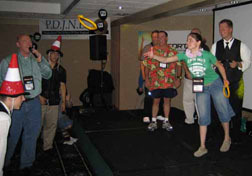 At the end of the evening, each member of the winning team (1/4 of the audience) receives a special prize that Sandy brings with her. 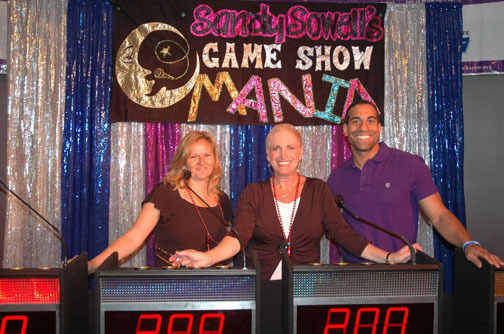 You can even personalize GAME SHOW MANIA with a few of your own company questions! 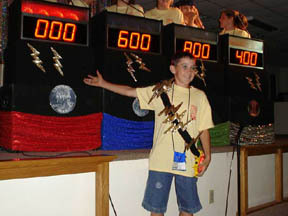 Lightning Bolt Boy is chosen from the audience and helps with the scoring. 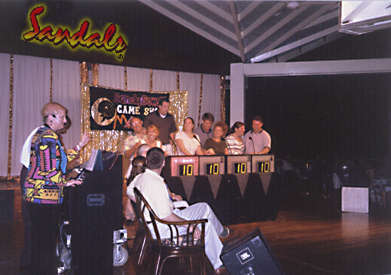 Game Show Mania at Sandals Negril! 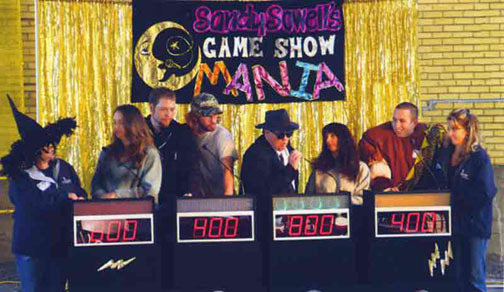 Check out the feature article that was printed May 21, 1999 in Jamaica's newspaper THE GLEANER on Sandy Sowell and Game Show Mania at SANDALS and BEACHES! 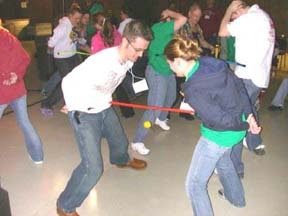 SUGGESTED VENUES: Fairs, after-dinner entertainment, schools, fundraisers, ice-breakers, company parties. All ages love this show! NEW! 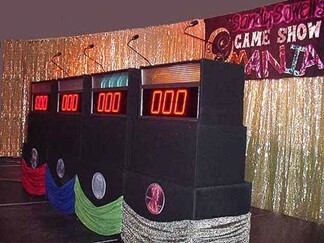 CARIBBEAN RESORTS considering the purchase of our new Mini Game Show Package and on-site training...click here! !